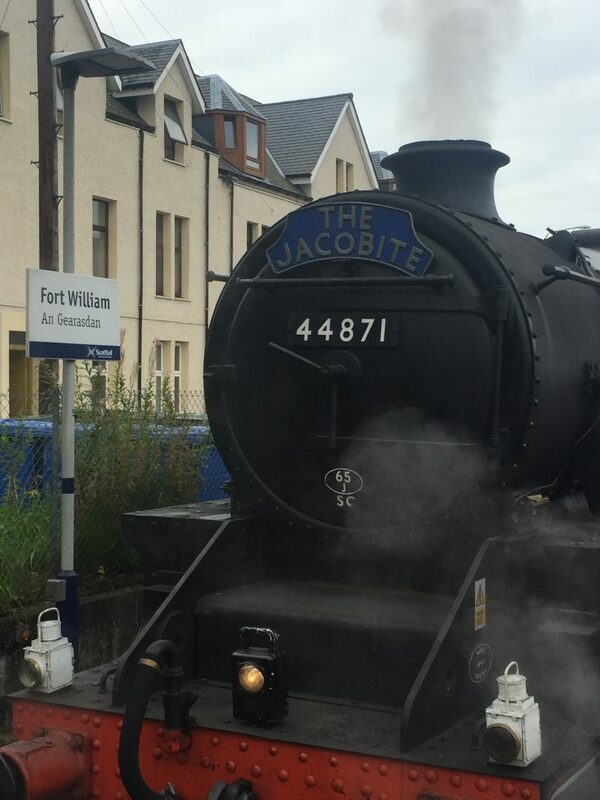 It was Saturday 2nd September and we were booked on the 10.30am Jacobite Steam Train from Fort Willian to Mallaig. The train was at the station when we arrived, and we couldn’t wait to get the journey started. 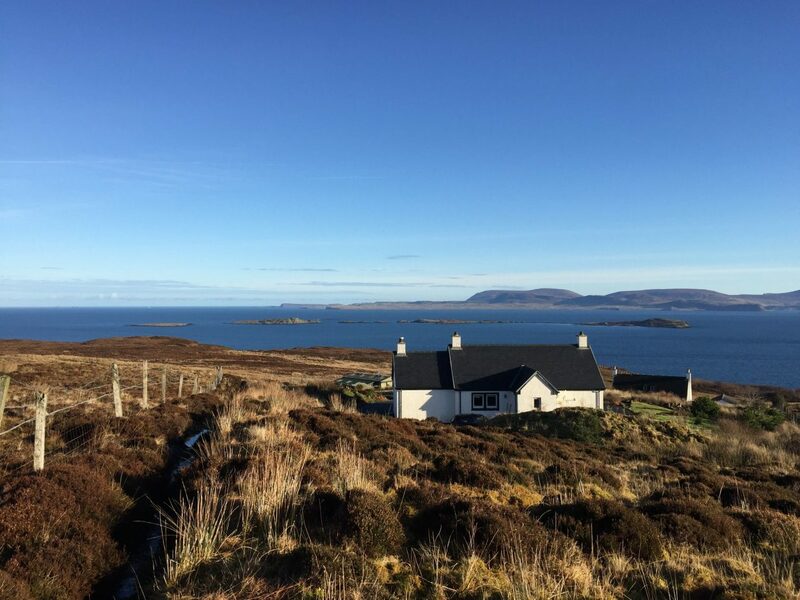 We had booked our early September departure in May, and this was the first weekend date available (so be sure to book early!) 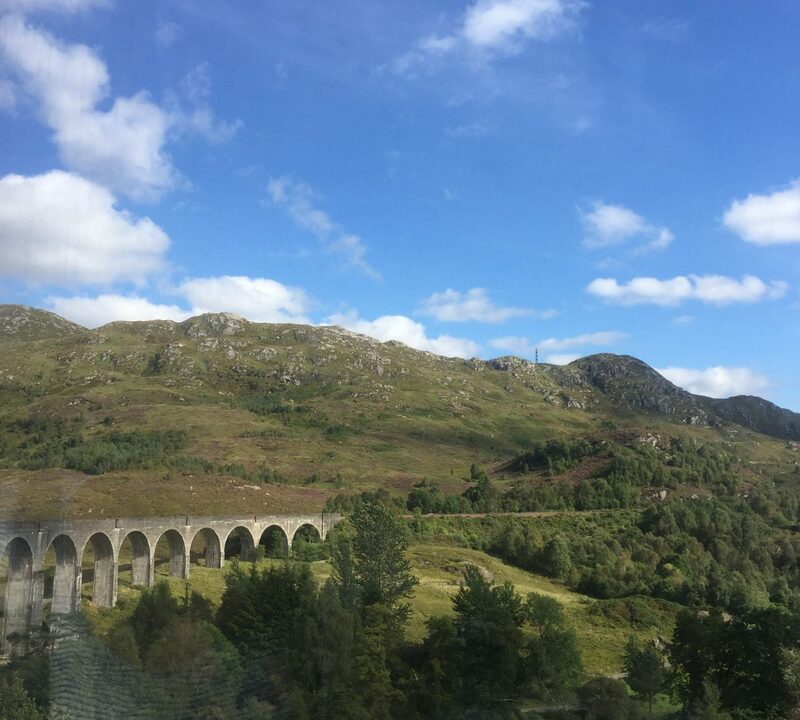 As part of the West Highland Line, this is one of the most spectacular railway journeys in the world, and this was our first time experiencing the trip. Nevermind Hogwarts we were going to the Port of Mallaig, and the sun was expected to shine for our arrival. The coalman was shovelling coal and getting the steam up as we headed to the Lochaber Cafe just inside the station for a bacon and egg doubler before departure. Hopefully, they have plenty coal! If you ever find yourself with time to spare in Fort William, then the Lochaber Cafe is excellent. The roll and coffee hit the spot and set us up for the two hours and ten minute trip to Mallaig. Our allocated seats were in Standard Class and cost £35 per person return. When you book, you cannot choose your seat number, but your outward and return journey seats change side so that you can see all the stunning scenery and don’t feel disadvantaged. You can also choose to travel in First Class, and tickets for that cost £59 per person return. I would love to say the interior is glamorous and reminiscent of bygone days but it was quite shabby and a bit dirty inside and the windows looked like they could have done with a wash.
With everyone onboard, the whistle was blown and the train started to ease its way out of the station. The noise, the smell and the steam puffing out the chimney then gently drifting past the window made it all feel very special. 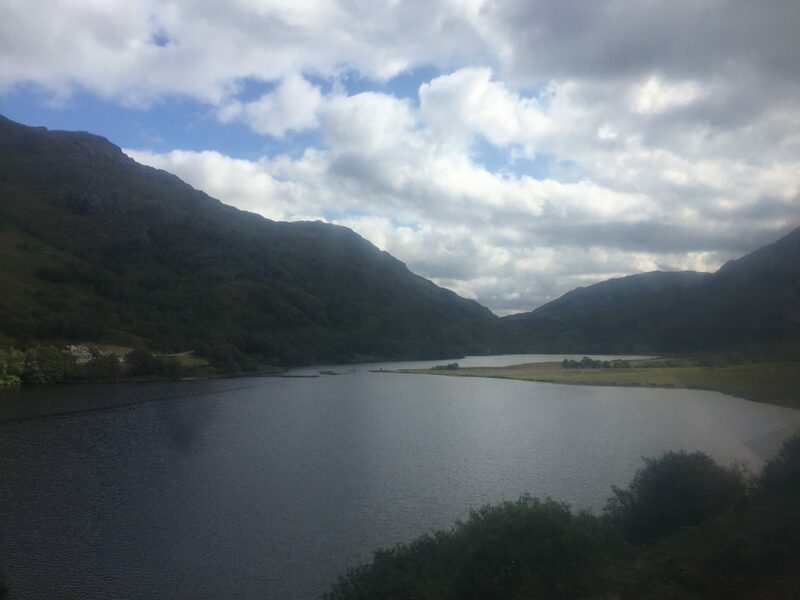 We relaxed, enjoyed the view and wondered how long it would take us to get to the Glenfinnan Viaduct. It didn’t take us long to realise why the inside of the train was the way it was. 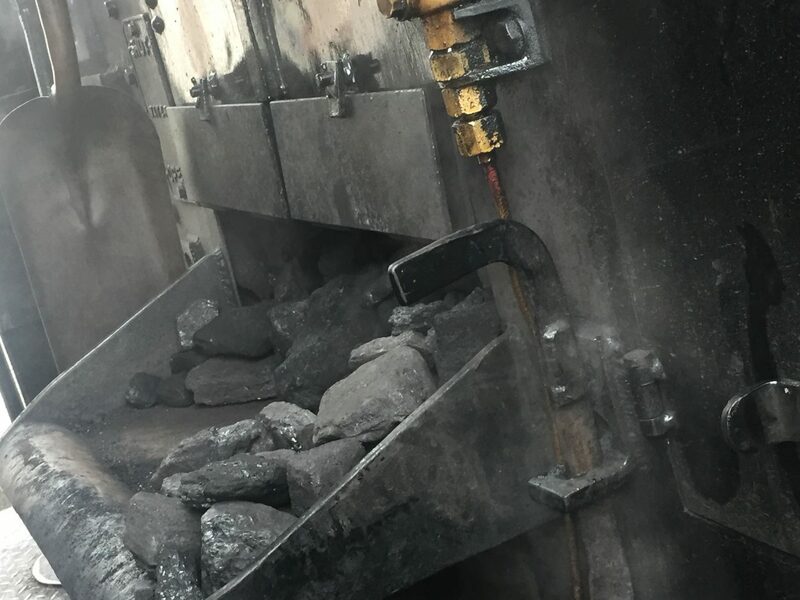 Soot, smoke, steam, open windows and tunnels are a recipe for a commotion. If you do take the trip, make sure that you keep the windows closed while going through the tunnels! 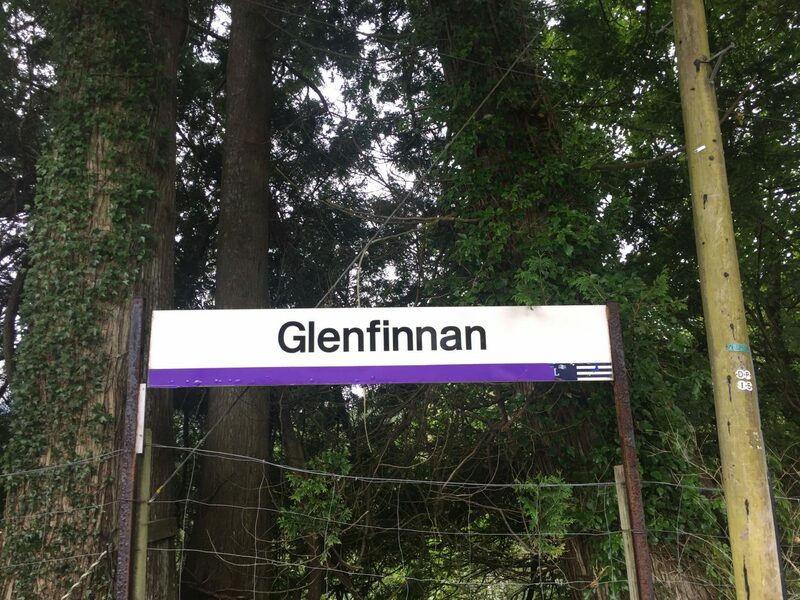 After passing over the much anticipated Glenfinnan Viaduct, the train stopped for around 20 minutes at Glenfinnan Station where you can explore the railway museum and have a quick snack at the dining carriage on the platform. There’s also a forest walk that you can wander to view the viaduct, but this takes longer than the allocated twenty minute stop – don’t try to fit it in as the train will leave without you! After a dreich start to the day, the sun started to come out after Glenfinnan, as we wound our way along the side of Loch Eilt. 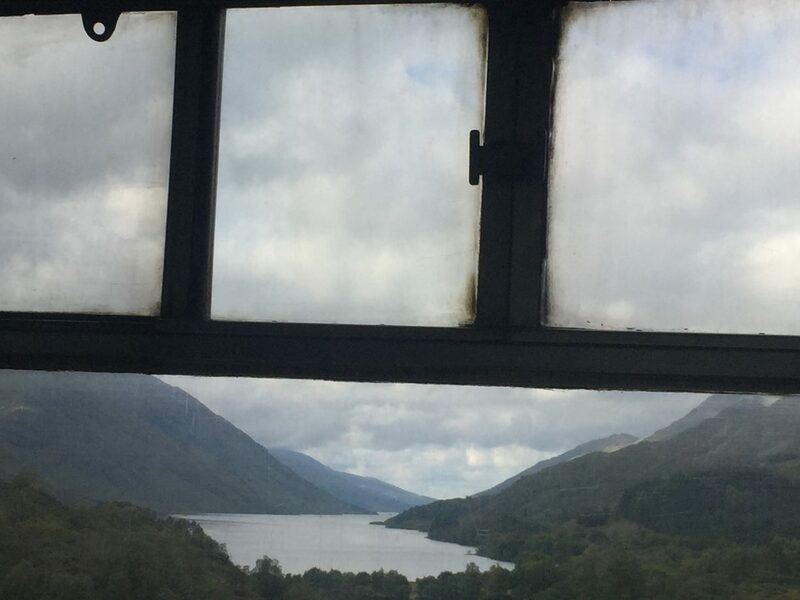 This loch is where Hagrid went stone skimming, and it’s one of my favourite views on the line with its tree-clad islands and glistening waters. Sadly we were on the wrong side of the train to take a good picture of the islands, and we forgot on the way back. 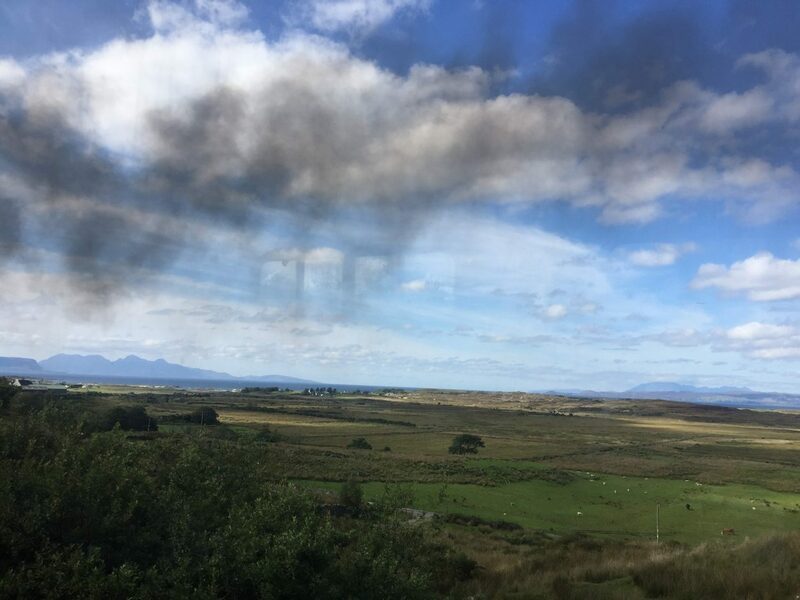 Passing through Arisaig, you start to get fantastic views of the white sands and of the islands of Eigg and Rum in the distance. Just in time for lunch, we arrived in Mallaig. The population of the fishing village swells quite considerably when the train comes in, so we decided to head straight to the harbour and found a seat in the sunshine at The Tea Garden Cafe. The terrace is beautiful with all their flower pots, and hanging baskets and the service was swift. 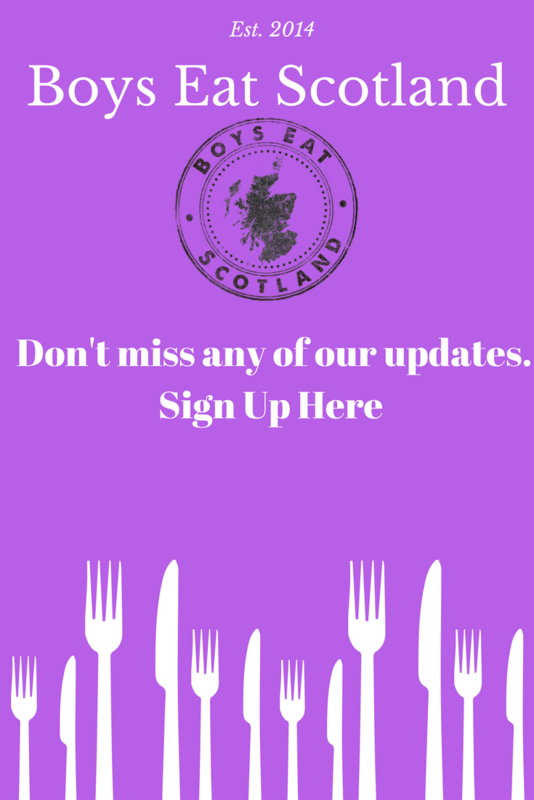 It’s evident that Mallaig restaurants are used to the twice-daily influx of visitors, and their speedy, friendly service matches the customer’s needs. Our drinks had arrived at the table before the waitress had finished taking our order on her handheld device. 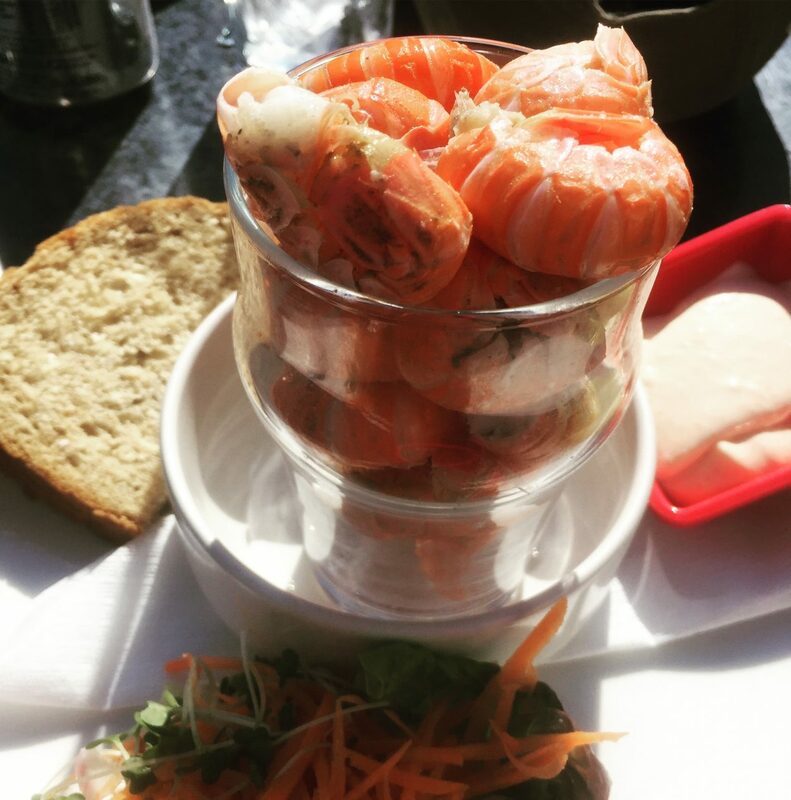 When in Mallaig, there’s only one thing to choose to eat – either a pint or half a pint of Mallaig Prawns with bread and butter. After my big breakfast roll, I just went for the smaller serving which turned out to be stacks. Raymond chose a hummus salad, and both dishes were thoroughly enjoyable. 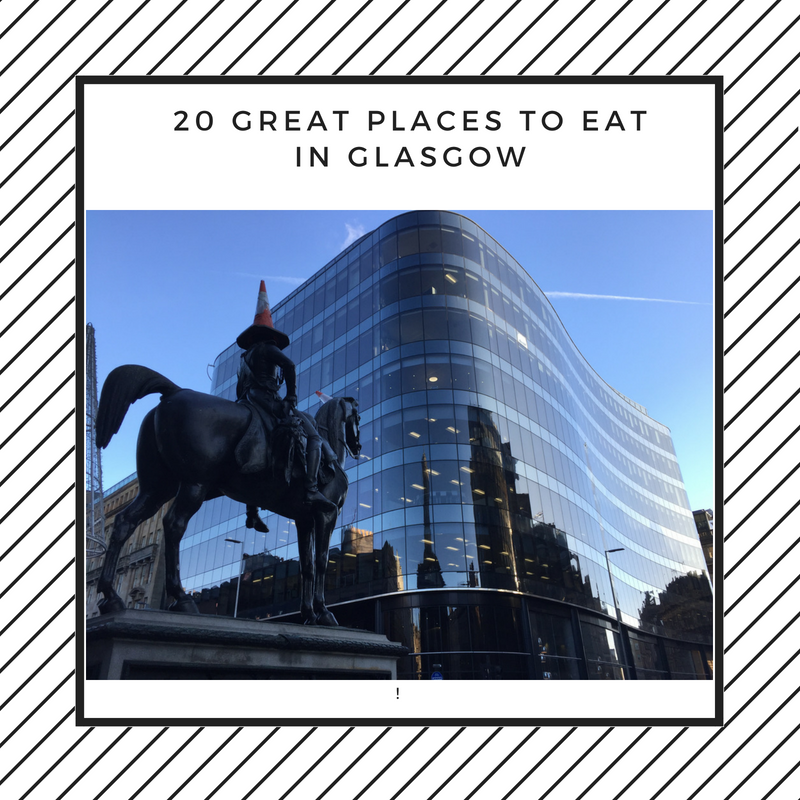 Mallaig Prawns – a half pint! After lunch, we had a wander down to the harbour, and the Skye ferry was just about to leave to cross over to Armadale – there always seems to be something going on in Mallaig. 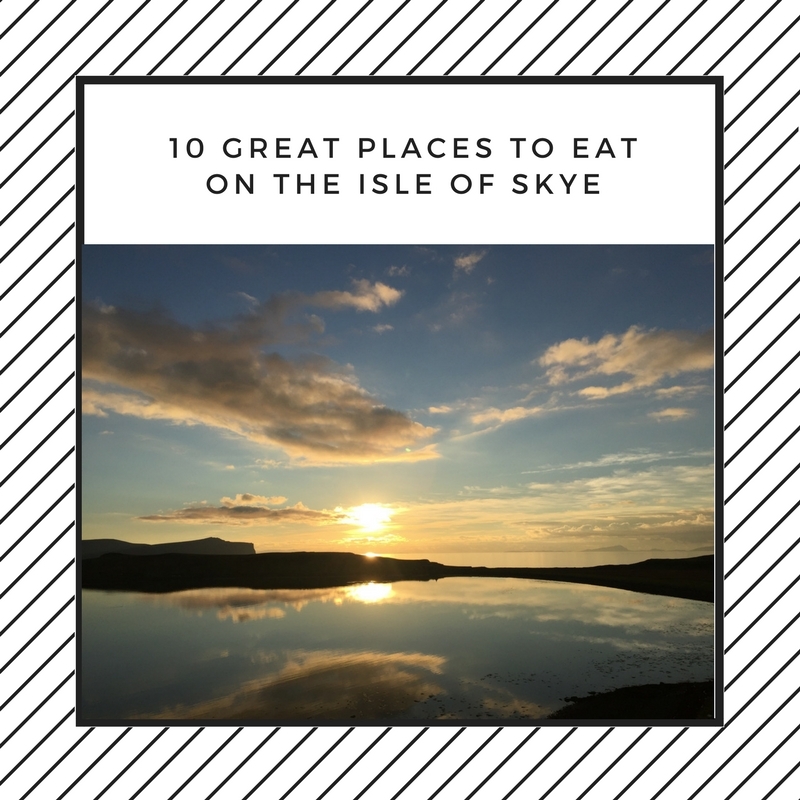 Further round the bay we came across The Bakehouse and Crannog which was a lovely surprise. They bake all their bread and cakes, and while they still had a few loaves left, their cakes had almost sold out. 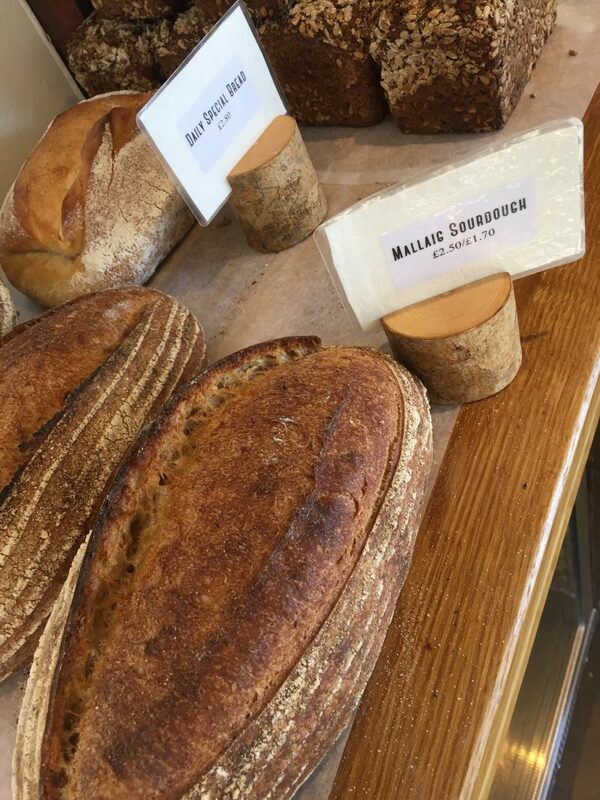 We took a Mallaig Sourdough, and a Rye bread home with us and they turned out to be two of the best loaves of bread we have tasted – sadly a bit far to go for our daily bread! They also sell Glen Lyon coffee, so we both had a takeaway Americano and a piece of Millionnaire shortbread. 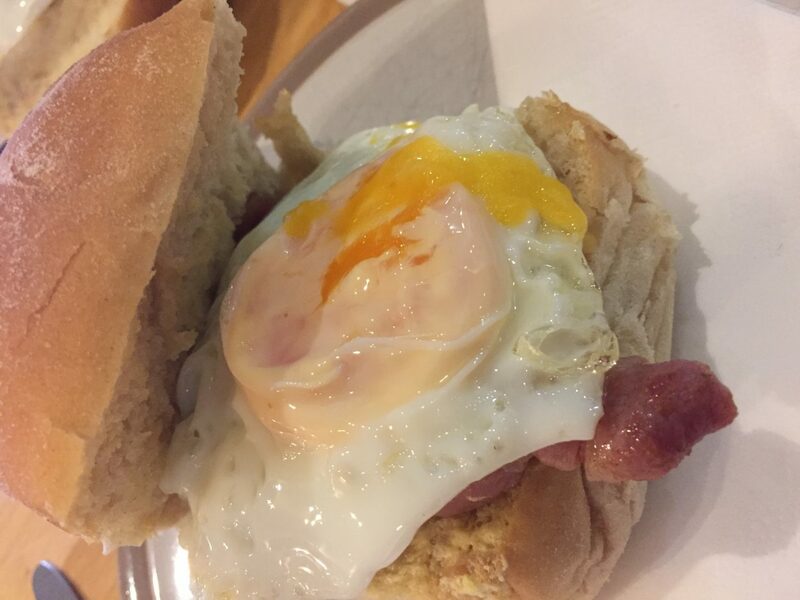 The picture we took of this sent our Instagram account into a frenzy, and yes it did taste as good as it looked. 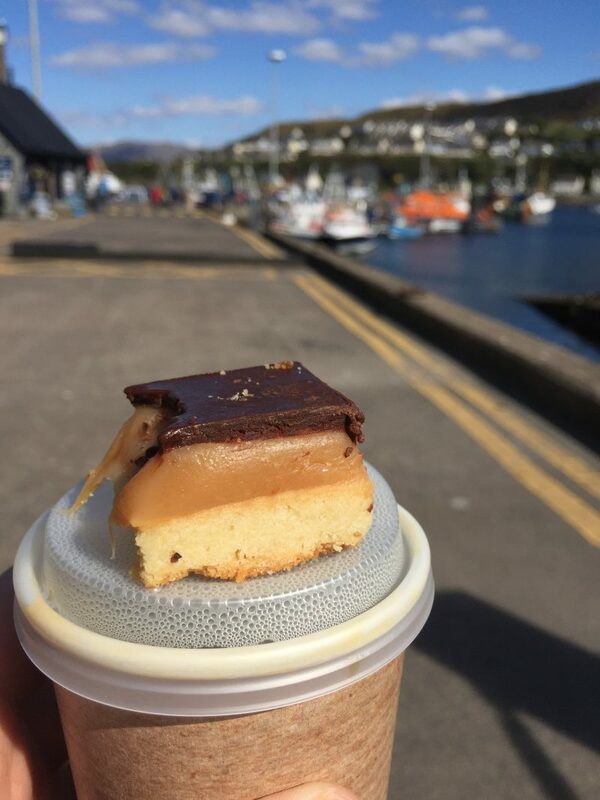 We thought the return train was at 2.20pm, so we sat at the harbour sipping our coffee, enjoying the scrumptious shortbread and taking in the last few rays of Mallaig sunshine before wandering back to the train. 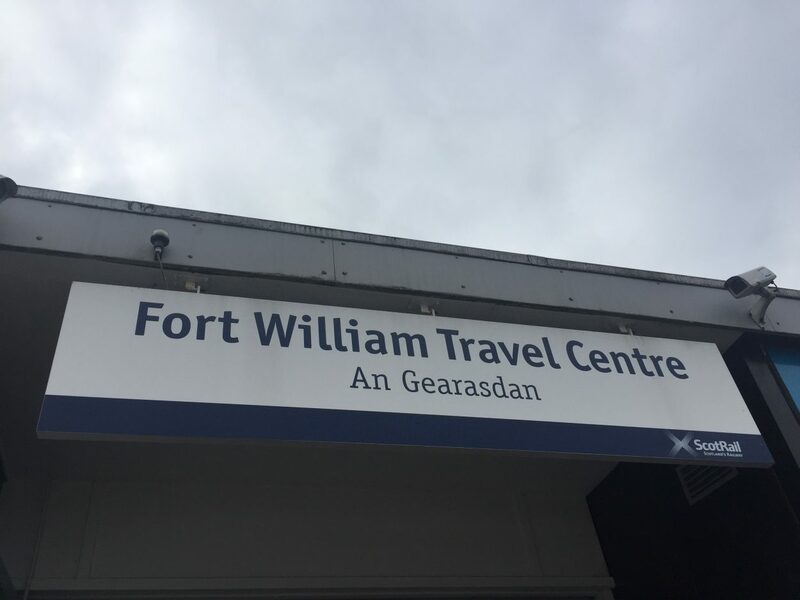 When we got back to the station, the platform was empty, and the conductor was hanging out the train asking if we were going back to Fort William. It turns out the train was due to leave at 2.10pm, and we had almost missed it! That would have been embarrassing after getting the tickets as a birthday gift from friends. On the return journey, some of our fellow passengers were enjoying afternoon tea and cheeseboards which are available to order separately in advance. The train also has a buffet carriage where you can enjoy a snack and a cup of tea or coffee. 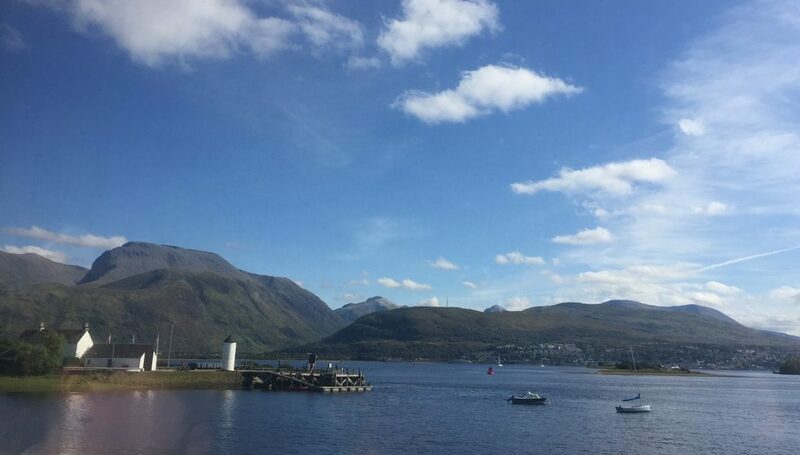 You don’t often see Ben Nevis without its cloudy hat on, but the view from the train across Corpach Basin and Loch Linnhe was stunning. With the Ben on one side and Neptunes Staircase on the other, it was a fantastic ending to a great day out. Fancy a trip on the Jacobite Steam Train. We had a thoroughly enjoyable day on the Jacobite Steam Train and would absolutely recommend the trip. We were so lucky that the sun was shining and that we were able to enjoy a great two hours wandering in Mallaig. 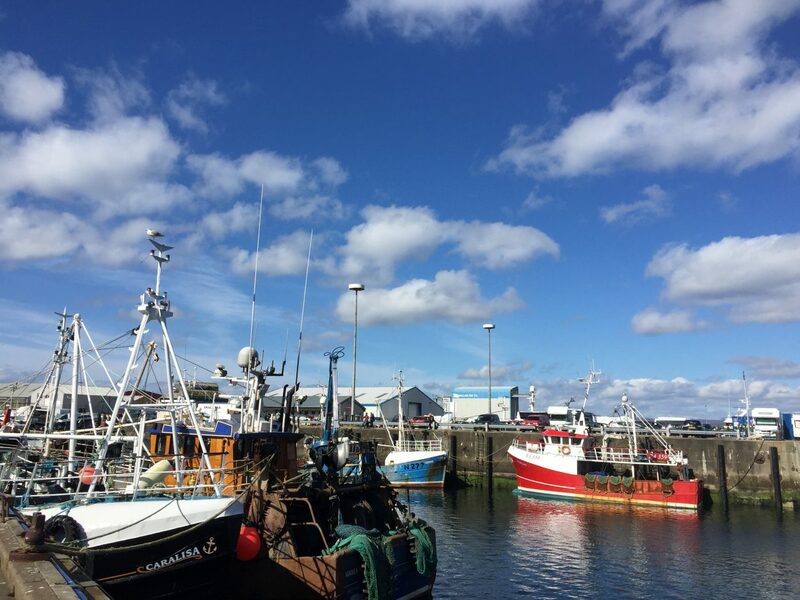 It might have been a wee bit different if it had been raining, but Mallaig has plenty restaurants and cafes to enjoy great seafood and tasty bites in. We recommend booking your tickets as early as possible as the return trip books up week and months in advance during the summer. 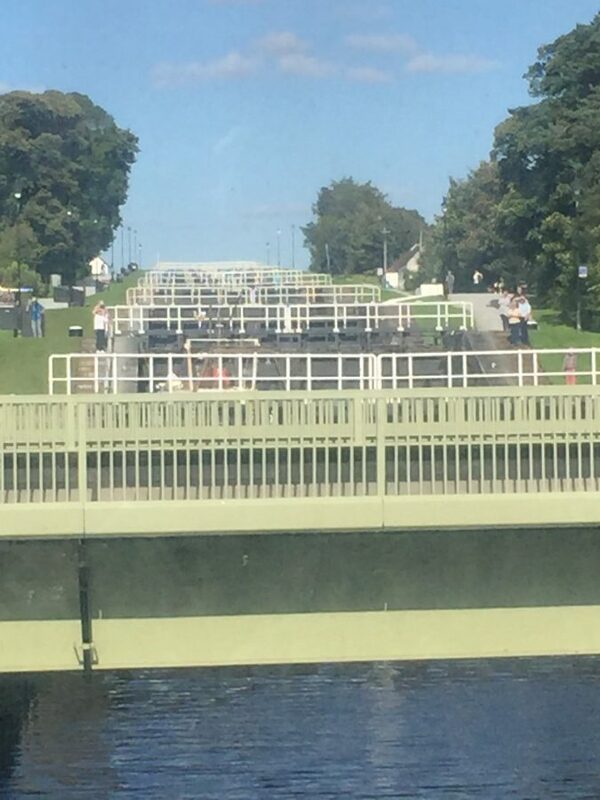 In addition to the morning train, they also operate an afternoon schedule which returns to Fort William in the evening. 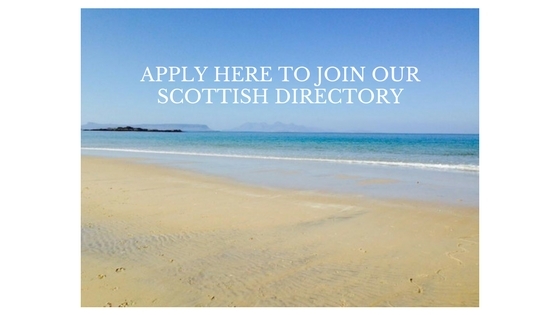 The train is seasonal so it’s best to check the website for start and end dates during the spring and autumn months as these will vary each year. A new December timetable is also in operation and the trip would be equally spectacular with snow on the hills and ice on loch and tickets would make the perfect Christmas present. Full details are available on the website here.